One of taller growing species of this genus, Ptilotus exaltatus has large cone shaped flowers, as good lilac pink that contrast well against the grey green foliage. Found widely over large areas of Western Australia, this is species that is treated as an annual, or short lived perennial. It does vary greatly in height, however the large flower heads are what makes this such a garden worthy plant. With good height the right variety will add a little structure to the garden, the smaller growing types are also suited for mass planting or for use as an edging plant. 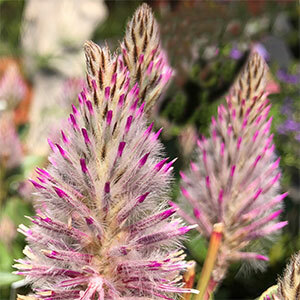 Similar to other Ptilotus species, drainage and good sun are the key to growing these native plants. In eastern states it is rain and moisture through the winter in poorly drained soils that cause most problems. This is a species that can be grown from seed and these are available from a number of online sources. Common Name – Tall Mulla Mulla. Soil – Very well drained with a little moisture.